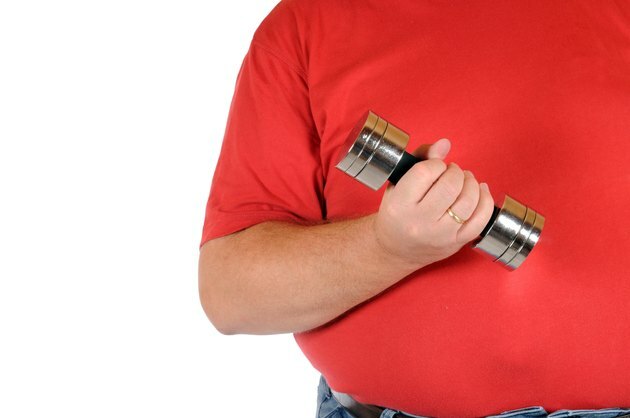 If you are diagnosed as morbidly obese, you must set time aside to take care of your health. Morbid obesity is linked with a long list of serious health issues, including high blood pressure, heart disease, diabetes and even cancer. When choosing your gym-based exercises, select low-impact exercises to minimize the stress on your joints. Always consult your physician before attempting to lose weight through exercise. Walking is a simple form of exercise that effectively burns calories. Even if you're morbidly obese and have no experience with exercise, walking for weight loss is straightforward. Whether you walk on the treadmill or on an outdoor track at your gym, the impacts from this exercise are comparatively minimal to some other forms of exercise. If you're morbidly obese, you probably don't have the stamina for a long or fast-paced walk. If this is the case, exercise in five-minute intervals throughout the day, if possible. Several types of exercise machines provide a low-impact workout that is ideal for those who are morbidly obese. The stationary bike and elliptical trainer, for example, allow you to move a number of major muscle groups and burn calories quickly without significant impact to your joints. Again, exercise in short intervals if you don't have the stamina for a long workout. Several short workouts are just as effective as one longer workout. Water-based exercises are ideal for those who are morbidly obese. When you exercise in water, the water cushions your joints as you burn calories. Swimming is an effective workout, but if you aren't yet able to perform this exercise, don't shy away from exercising in the water. Water aerobics or even walking in the shallow end of the pool are still effective ways to work out. Strength training contributes to weight loss by raising your metabolism, and the exercises don't have to be complicated. Being morbidly obese could limit your ability to perform many body-weight exercises, such as crunches and squats. Instead, use free weights for basic exercises such as curls, presses and flyes. The added muscle mass you create strengthens your body, which will eventually help increase the ease with which you can perform your workouts. How Many Calories Are Burned by Water Aerobics? Which Exercise Burns the Most Calories: Running, Swimming or Walking?